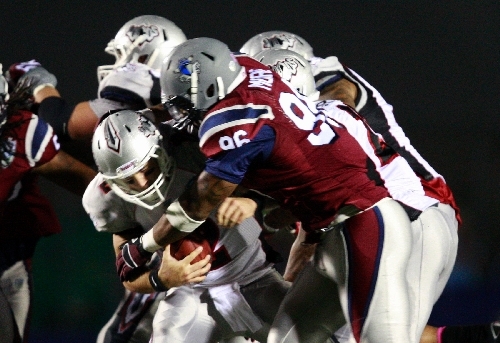 The Las Vegas Locomotives never got untracked offensively and could not cash in on three takeaways as the Virginia Destroyers made a 17-3 halftime lead stand up to win the United Football League title. VIRGINIA BEACH, Va. — Apparently, three days wasn’t enough time for the Locomotives to prepare for and win a third straight United Football League title. The Locos, looking stagnant and listless on offense, probably needed three weeks to figure out how to move the ball against the Virginia Destroyers. And even that might not have been enough time to guarantee victory Friday. The Destroyers jumped to a 14-0 lead and coasted to a 17-3 win in the UFL championship game before 14,172 at the Sportsplex in what could be the 3-year-old, financially plagued league’s final game. Virginia coach Marty Schottenheimer, who struggled to win the big game when he coached in the NFL, was glad to capture the UFL title. The Destroyers (4-1), who lost the title game to the Locos (3-2) in each of the UFL’s first two years when they were the Florida Tuskers, didn’t let Las Vegas get the three-peat it so coveted. They hounded Locos quarterback Chase Clement all night in one of his worst games in his two years as Las Vegas’ starting QB. Clement threw for just 93 yards and didn’t generate a first down until 7:45 remained in the third quarter. He was sacked six times and picked off three times by title game Most Valuable Player Aaron Rouse, including a 46-yard return for a score in the first quarter and an interception that saved a fourth-quarter TD. The Locos managed just 154 yards of offense. Despite the mounting speculation the UFL is finished, Locos owner Bill Hambrecht said before the game he thinks the league will return in 2012. But he couldn’t say with 100 percent certainty the UFL will be back in Las Vegas. Each Destroyers player was paid a winning share of $6,000 for the title game, and each Locos player received $5,000. The Locos dug themselves a 14-0 first-half hole as Clement struggled badly. Under constant pressure, he often was forced to throw from off his back foot. Rouse was handed a gift in the first quarter, and he always seemed to be around the ball. Early in the second quarter, the Destroyers’ Clifton Smith returned a punt by Danny Baugher 60 yards to the Las Vegas 7. Two plays later, UFL rushing leader Dominic Rhodes scored on a 1-yard run. Clement didn’t complete his first pass until 8:47 before halftime. With about six minutes left in the half, the Locos finally got a break, as defensive tackle Alfred Malone sacked Destroyers quarterback Chris Greisen at the Virginia 20, forcing a fumble that defensive tackle Montavious Stanley recovered. But the Locos’ ensuing drive stalled, and they settled for a 32-yard field goal by Clint Stitser. Greisen led the Destroyers right down the field on their ensuing drive, and Delbert Alvarado kicked a 21-yard field goal with five seconds left in the half. The Locos, held to 35 yards of offense in the first two quarters, blitzed more in the second half. Linebacker Brandon Moore had a sensational one-handed interception early in the fourth quarter. But the offense didn’t cash in. But the Virginia defense made life miserable for Clement. “I guess they were due to win one after we got them the first two years,” Moore said. KEY: Safety Aaron Rouse had three interceptions, including one he returned 46 yards for a touchdown in the first quarter.